Toronto FC are MLS Cup champions for the first time in history. Almost a week after Toronto FC won its first MLS championship, the hometown sports hype in the city just won’t stop. In the wake of the Argos Grey Cup victory. Toronto FC defeated the Seattle Sounders in a rematch of last year’s MLS Final where Toronto was handed defeat falling short on penalties. 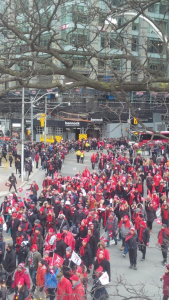 It was a different scene in the streets of Toronto as last year fans left BMO Field disappointed. But this year, the party was on, as Toronto FC reigned supreme defeating the Sounders 2-0 on home turf in front of a packed BMO Field. Spirits were high in Toronto before kickoff where thousands gathered to march together, unified as one to BMO Field. Flags, banners, air horns, drums and red flares, lighting and smoking up the city of Toronto in the bright red colour of their passionate soccer team in hopes for a win. “I really hope we can pull this win off. We’re looking for some payback and there’s no better way to do this at home and win this for everyone here in Toronto,” said Mario Cosentino, a Toronto FC season ticket holder for three years. He also sits directly behind the net where the so called “U-Section” is. This is the section of the stadium where the loudest fans are. There is almost no sitting during the match and it consisted of constant chanting all game long. The game began, with the packed house at BMO Field roaring. The first half ended in a tie. At the 67th minute, striker for Toronto Jozy Altidore found the back of the net and Toronto went ahead with the home crowd letting out all their excitement. More smoke and red flares begin to flame from the U-Section as an anxious 23 minutes remained, but ultimately, TFC added one more goal in the closing moments and the final whistle blew. Toronto FC had written its name in the history books. 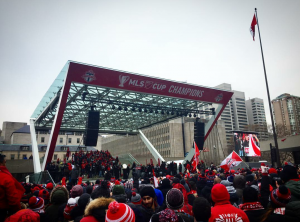 Shortly after capturing the MLS championship, the plans shifted to Monday, where it was announced a parade would be held in the streets of Toronto starting in front of the Air Canada Centre and leading all the way through to Nathan Phillips Square. The outcome was phenomenal. The supporting U-Section was out in full force leading the parade along with all the TFC players who were on a double decker bus lifting the trophy every so often having just as much fun as the passionate Toronto FC fans with all their flags and banners who begin to chant as the parade moves along. The stage at Nathan Phillips Square honouring the latest MLS champions. “Two parades in two weeks?” said Chris Duggan. “I’m not a real huge sports fan, but I am now. The sports culture has changed in Toronto.” About 1.4 million people tuned into the MLS Cup final on TSN and which then spiked to over 2 million once the game was in its closing minutes, making it Canada’s most watched network on Saturday. 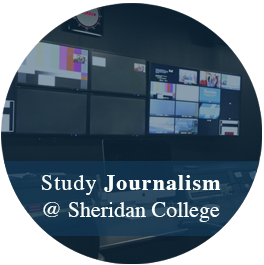 20 year old Journalism college student at Sheridan College, has a passion for sports and writing. Follow along with me on twitter at @JacobPacheco30.